For a so-so author of throwaway airport thrillers, Tom Clancy has done alright for himself. I don’t mean to slight the man ? in my younger years I read and enjoyed at least one of his novels ? but consider this: from the variously successful big-screen adaptations of his Jack Ryan books to the outright novelty of several series of novels ‘inspired’ by his intellectual property, not to mention a trio of board games, Clancy seems quite content to sit back on his billfold bed and let the royalties roll in. In fact, the latest licensing deal to have arisen from his empire involved nothing less than the sale of his own name to Ubisoft, the French development studio behind such torrid mini-game fare as the irrepressible rabbids of Rayman fame are wont to inflict and the thematically daring but otherwise by-the-numbers Assassin’s Creed ? oh, and something like thirty Tom Clancy Presents games. In the last decade. It wouldn’t be unreasonable, then, to expect that the maintenance of any kind of quality bar through such an overwhelming mass of quick-fire development cycles might prove, well? taxing, to put it lightly. There have certainly been some disappointing Clancy games; there have, indeed, been some downright awful entries in the each of three franchises that have spearheaded Clancy’s involvement in video-games. And yet. Perhaps the most striking thing to emerge from a long-sighted look at the history of Tom Clancy in gaming is that his name, among only a few others, has proven to be a mark of ? if not revolution or innovation ? then, at the least, remarkably consistent, above-par entertainment. Take the Ubisoft studios behind the Ghost Recons, the Splinter Cells and the Rainbow Six series: they’re hardly equivalent to the Meiers and the Molyneuxs of the industry, but there’s something to be said for the simple fact that they can be relied on. Even the very worst of their missteps would have been much improved by a few months longer in the proverbial development oven. 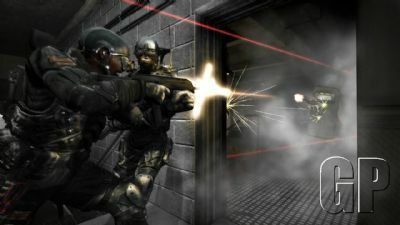 And so, it’s something of a relief to see that 2007 marked Rainbow Six‘s first year off for a decade; their first holiday, in fact, since Red Storm Entertainment first conceived of the elite squad that gamers have come to hold so dear. But where did everyone’s favourite combat operatives go? Well, I’ll tell you: they went to Vegas… again. Kind of. In all, then, Rainbox Six: Vegas 2 is more than a little disappointing. Few things would give me greater pleasure than to say the time off has done our boys a world of good, but sadly, for the sophomore instalment in the Vegas offshoot of Rainbow Six, Ubisoft Montreal has played it safe. Throughout the entire experience you can almost smell the shareholders, and quite frankly, their inexorable push for quick sequels stinks. Let it be said that before culture will openly accept gaming as a valuable form of art or even entertainment, the tug of war between developers and publishers needs to stop, but here once more, hidden with the utmost cunning in plain sight, we see such petty tensions clawing their way through what is otherwise an excellent game. You can expect a host of new maps, same as the old maps, a levelling system and some supposedly original modes of play that have been ripped wholesale out of Call of Duty 4, plus some bug fixes ? long past-due ? and as a better, though still imperfect lobby system. Except for the baffling reduction of players able to duck-and-cover their way through the underwhelming story mode co-operatively, the new features are not at all unwelcome. Bugs need fixing, and the dedicated Rainbow Six community will be glad Ubisoft took the time to address the majority of them; new maps and modes always provide a refreshing new challenge, and considering the excellent gameplay mechanics of this particular Clancy franchise, a welcome one; but in the end, this isn’t a patch or even DLC, it’s a full-price sequel. The RPG-lite levelling system, shared now between campaign and multiplayer, offers an involving, if cursory sense of achievement as you unlock new weapons or XP bonuses. The single-player itself, while it lasts, is a fun, uncomplicated ride, but it lacks the impact of the series’ last instalment. 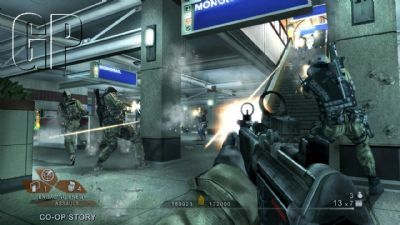 Call of Duty 4‘s short, sharp shock of story mode puts it to shame; even the sheer spectacle of the first Vegas is absent, unaccountably, and much of the fun, however silly it was, has slipped away with it. The grandiosity of the theatre, certainly the campaign’s highlight, seems a jarring glimpse of past glory; sandwiched between a convention centre textured almost entirely in unabashed advertising and some dreary action out in the Nevada desert, you hardly have time to appreciate the game’s sudden show of strength before Ubisoft squanders it before your very eyes. Even the narrative, suspect as it was in the first Rainbow Six: Vegas, lacks the graciousness to follow through: this time around, you’re in command of a new squad who fight alongside Logan ? a B-team, if you will, in the same vein as the nobodies from the expansion packs that F.E.A.R has coasted on so long. You are, essentially, the abortive Blade Runner sidequel Soldier‘s Kurt Russell next to Harrison Ford’s immortal Deckard. In all, then, Rainbox Six: Vegas 2 is more than a little disappointing. That being said, it remains among the leaders of an increasingly crowded pack. The solid, responsive mechanics of the first instalment are present and correct, environments are credible if not remarkable, online adversarial and co-op play is as satisfying as ever ? which is to say immensely, despite the sub-standard new settings ? and the AI has been practising. Surely this game’s greatest pleasure, and the point at which it finally begins to shine, is in terrorist hunt. Brave realistic difficulty and set the enemies to high density, invite a few friends or hop into a public game over Live, and provided your teammates can communicate as well as shoot, count yourself in for an experience worth every inch of the unquestionable challenge it poses. You’ll rarely encounter such tight tactical action as this mode showcases, and in the campaign’s finer moments it, too, begins to approach the visceral intensity of terrorist hunt. 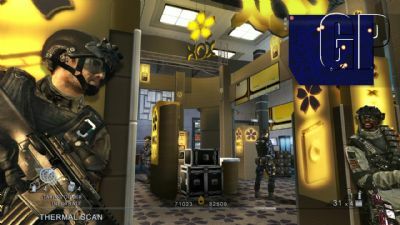 Improvements are the exception rather than the rule in Rainbow Six: Vegas 2, but built upon the foundations of an exemplary first outing, even those features left untouched are significantly more fulfilling than the alternatives offered by so many of the genre’s latest cut-and-paste shooters. What this game does, it does well; it can and has done better before, but even so, it puts the Timeshocks and Turoks of the industry to shame for their shallowness. If anyone is labouring under the impression that the Clancy franchises sell so well because of the none-too-subtle name-checking on their boxes, prepare for a shock; they are, nearly every one, solid ? if rarely spectacular ? games. Where this second adventure in Vegas goes wrong, ultimately, is in its packaging. As a mid-priced expansion pack, it would be difficult to fault. More of the same is precisely what gamers have been conditioned to expect from such releases. As a sequel ? as an entity that should not merely continue an experience but expand and enrich it ? 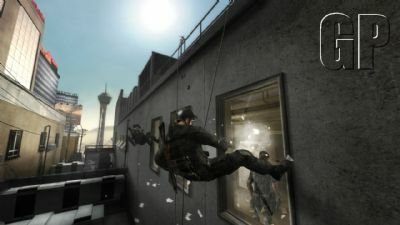 there are no two ways about it, Rainbow Six: Vegas 2 is not all it could be, nor all it should be. I say double or nothing. 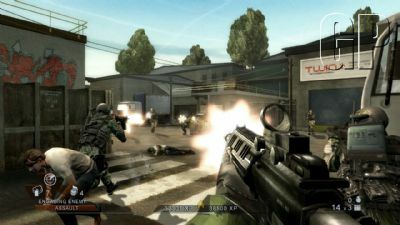 The Good: Tight, responsive gameplay mechanics make for more excellent tactical action; co-op campaign and terrorist hunt are the real standout; much improved AI from the first Vegas; persistent levelling adds a nice sense of progression.